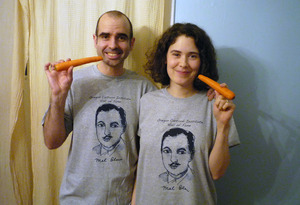 Yes, you are allowed to wear the official Mel Blanc Project T shirt to Oregon Cartoon Institute’s four part lecture series exploring the formative influence of Mel Blanc’s early Portland years on his later career. Alternatively, you can wear your Mel Blanc Project T shirt when you go to the Oregon Jewish Museum’s wonderful exhibit, That’s All Folks! The Mel Blanc Story, opening June 2. Purchase T shirts here. Only XL left.